The email client Thunderbird and the Internet browser Firefox can do spelling checks if a dictionary is installed. Dictionaries for multiple languages can be installed. Usually a dictionary is installed by opening Add-ons menu, then in the search field write the English name of the language, e.g. German for Deutsch, to search for a dictionary. For unknown reasons there is no Swedish dictionary to be found, even though this used to be available through the normal add-on menu search. 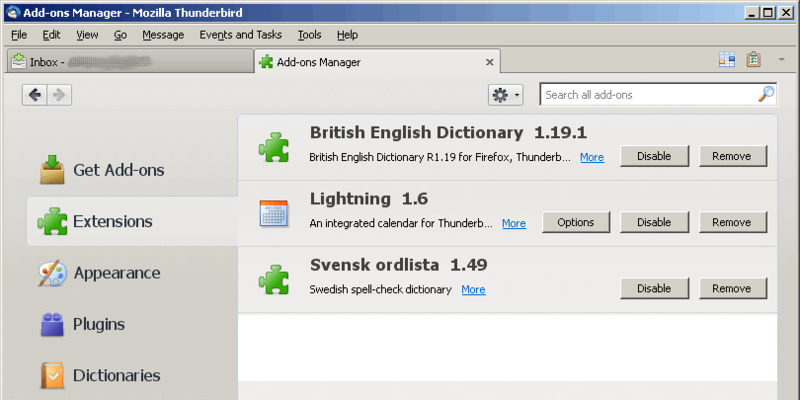 Nevertheless, it is possible to install a Swedish dictionary. Cebit is the world largest ICT exhibition. 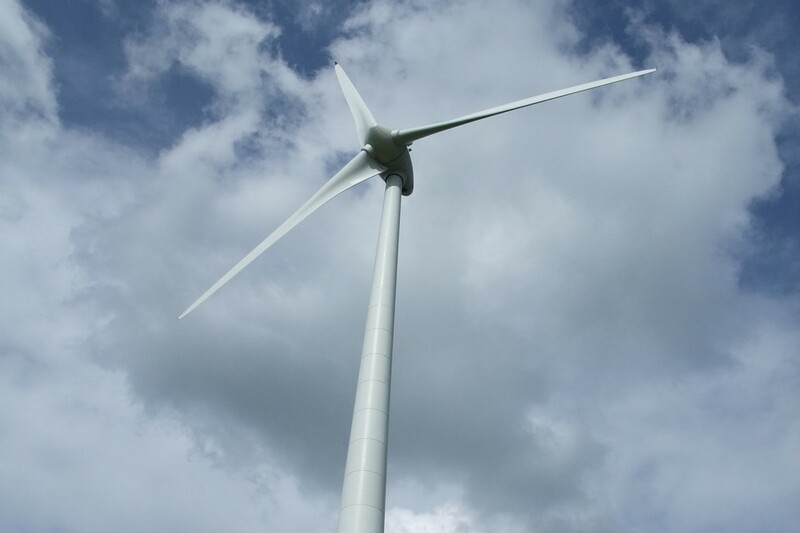 It runs every year at the beginning of March in Hannover DE. 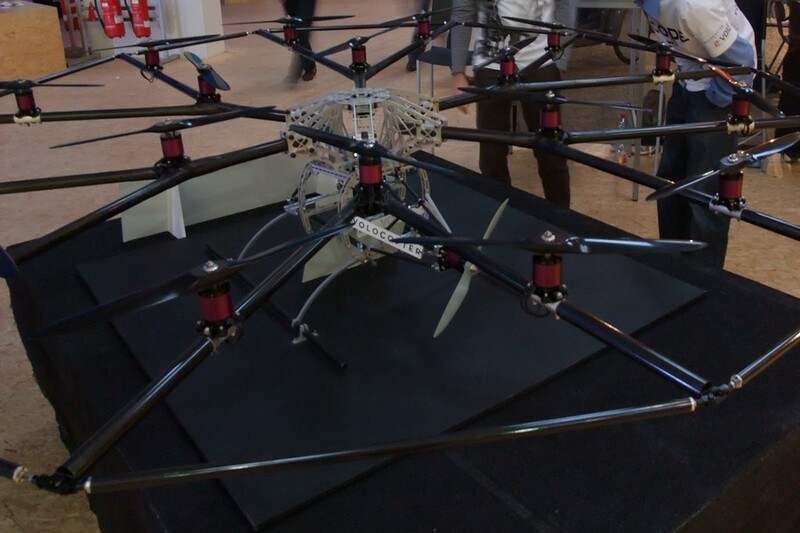 Multi-rotor helicopters as micro-copter and development scale model of soon human flight were on display at Cebit this year. Also flexible display walls, wireless charging add-on for Samsung Galaxy S3 and more 3D printers. This beside the usual selection of new PC and notebooks. Movies are like magic, they are able to put the most fantastic scenes together and can claim the location to be anywhere. It works in the story, but reality is often different. Article with examples of filming locations for Bourne Identity and other films. I had a main-board of a Hewlett-Packard HP C7280 all-in-one ink-jet printer for repair. The client explained that the printer would work alright for some prints but later report error and freeze after running in stand-by for some time. The error code reported is 32 bit hex code 0xc19a0035. It looks specific but might actually be a catch-all general error code. Two of the capacitors on the main-board had a slightly bulged top. This indicate that the component is broken and it does no longer provide the capacitance. A case of bad capacitors. Without knowing the details of the schematics, it appeared likely that these capacitors were for stabilising power lines. The negative side was connected to ground. Broken capacitors could cause noise on the power line for the connected components and that in turn may cause a logic error for signal lines and result in the system to reporting the error. The failed capacitors are 680uF / 6.3V and 330 uF / 10 V, both rated for temp 105C, manufactured by Teapo. Two further capacitors to the right were same types both looked alright. It turned out to be rather difficult to heat the solder points for the GND pins. The GND connections are made as a “ground-plane” and when heating it with solder iron rather than heating just the spot the heat dissipate quickly in ground-plane, so much that it never melt the solder tin. I needed to use a hot air solder and increase to 480 C to de-solder. At this heat level you risk collateral damage to neighbouring components if you are not careful. For the PCB layout it is not good that Hewlett Packard connected the negative pins to the copper-pour of the ground plane. It would have been easy to de-solder / solder had they used a thermal relief for those component pin holes. 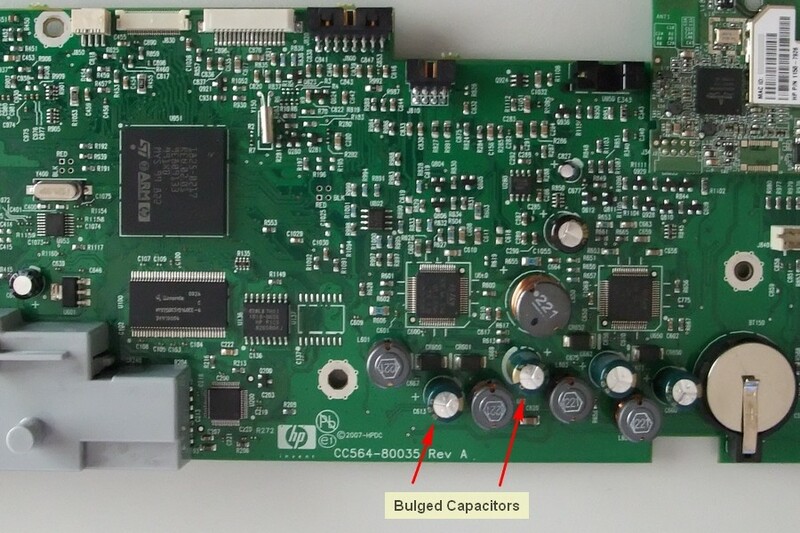 The Teapo capacitors were manufactured in week 04 in 2008, and the printer had been in use less than 5 years. It is bad quality that a capacitor last that short. PDF is normally used as a final publishing format for sending documents that are complete and the receiver only read. It is less known that PDF has an option which allow to create an entry form that can be edited and saved by the receiving user. Most standard PDF viewers can be used to edit the form. This provides a simple practical method to publish forms that a user can fill out by the keyboard rather than on paper. The form makes it clear to the user what fields should be filled out and user editing does not risk breaking the layout of the form. New article about how to encode business card address details into a Datamatrix 2D bar code, that can be scanned by smart-phone or other scanner. The sun is shining and spring time has arrived in Luxembourg. 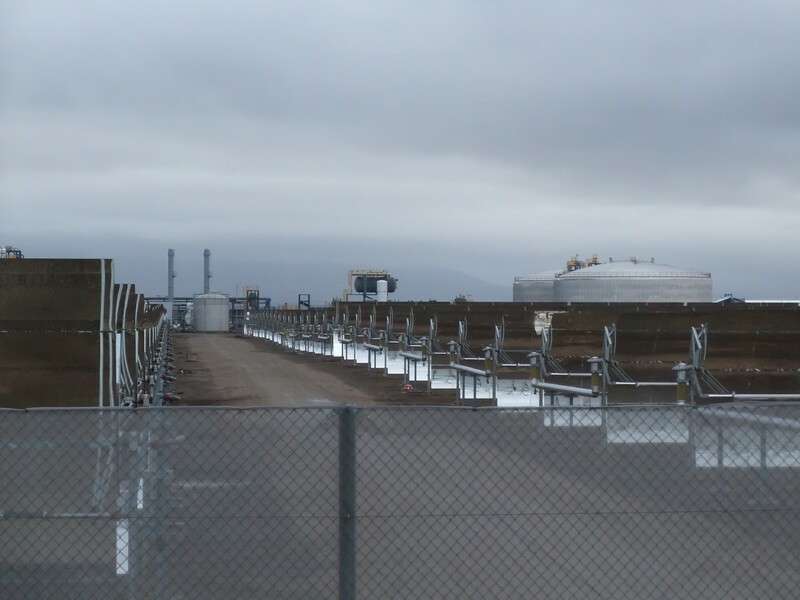 Photo from Andasol 2 at Guadix ES before plant went into operation.